The B movie is a tricky thing. The name came when people used to go see double headers. One film would be a big budget more serious movie and the 2nd or B movie would be a lower budget more campy film like a low grade monster or cowboy movie. 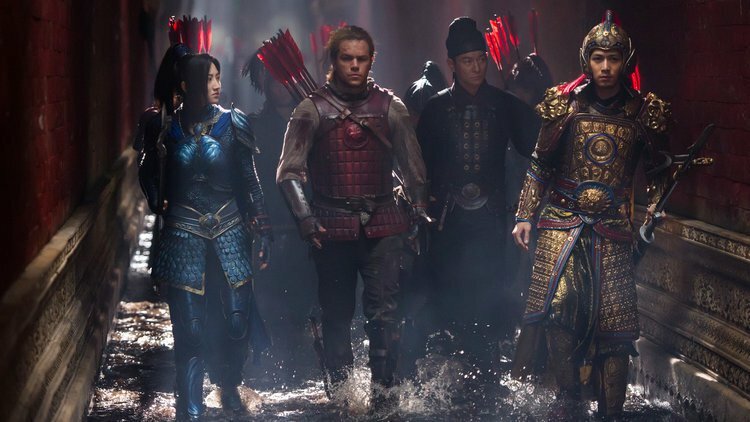 While The Great Wall has a large budget ($150 million but it has already made $224 million in China) it has the feel of a B movie and I think it is enjoyable on that level. It’s not a great movie but B movies never were. They were just silly, over-the-top movie going experiences. 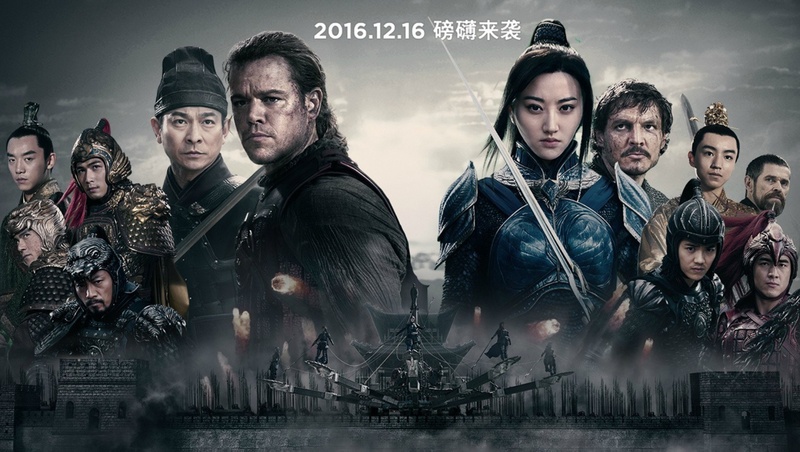 In truth, The Great Wall is a monster movie (again in the spirit of B movies). It is directed by Zhang Yimou who received an Oscar nomination for the 2002 film Hero and is famous for directing House of Flying Daggers. 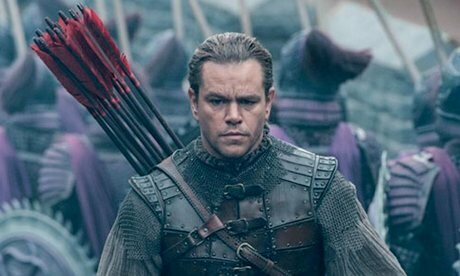 In The Great Wall he puts down martial arts entirely and makes, like I said, a monster movie. Matt Damon is admittedly wildly miscast in the lead role with a wandering Irish (I think) accent (It’s the kind of role Arnold or Stallone would have played in their hey-days). But he plays William, a man who has journeyed to China to find ‘black powder’. He and his buddy Tovar (Pedro Pascal who has a different accent that is never explained) are attacked one day by a mysterious monster with green blood. They take the hand of the monster and present before a castle at the Great Wall of China. The wall is ruled by an army called the Nameless Order who are skilled fighters including Zhang Hanyu, Andy Lau and Jing Tian. It turns out the order is preparing to face off against the monster that William beat. They are kind of like zombies or orcs and there are a lot of them and they don’t shy away from the non-bloody PG-13 killing and warfare. The 3D is very effective in these scenes with arrows flying at your face and monsters coming towards you. It really is a lot of fun. They also have clever warfare strategies like women hanging on ropes and swinging with their bow and arrows. A lot of people are going to be concerned if this is a white savior film and it has its moments for sure but it wasn’t as bad in that regard as I thought it would be. For the most part the Chinese are equally great at fighting monsters as Damon. I also appreciated that there isn’t really a love interest. It’s hinted at but never really materialized. The women are there to fight monsters just like everyone else. Is this movie cheesy? Of course it is but that’s part of the B movie fun of it. The dialogue is campy and the action is over-the-top. There were some boring sections and the William Defoe character is completely unnecessary but I think if you go in with the right attitude you can enjoy The Great Wall. It’s not a great movie by any stretch of the imagination but in the spirit of B movies it’s an entertaining movie. It’s certainly a million times better than the ponderous tombs we got last year in films like Warcraft. If you decide to give The Great Wall a shot let me know what you think. See this in the theaters because I don’t think it will be as fun at home. < Lego Podcast and Happy Valentines Day! I tend to have a soft spot for B movies or fantasy movies (my Letterboxd list for Fantasy alone is apparently large enough to have people questioning my taste in films), and so when I saw the trailer I did think “this could be right up my alley in a guilty pleasure sort of sense”. And I would say your review reflects those expectations. With that said, it’s US box office expectations don’t look great. The vibes I’m getting from this are like the 2011 ‘The Three Musketeers’ film. I’m stil contemplating whether to watch this. Is it really long? 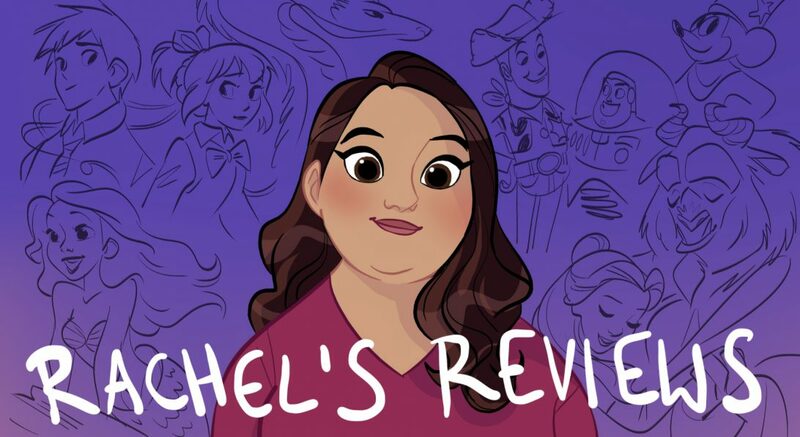 Pingback: Kong: Skull Island Review – Reviewing All 56 Disney Animated Films And More!